If you have been reading this blog for any length of time, you know I am a huge fan of the recipes on Iowa Girl Eats. She just discovered she is Gluten Free and so makes recipes that follow her strict diet which in turn helps me. I am always drooling over her recipes and her pictures. And guess what? Her recipes rock! Her gnocchi and chicken sausage vegetable skillet was no exception. It highlights all the best flavors of summer. 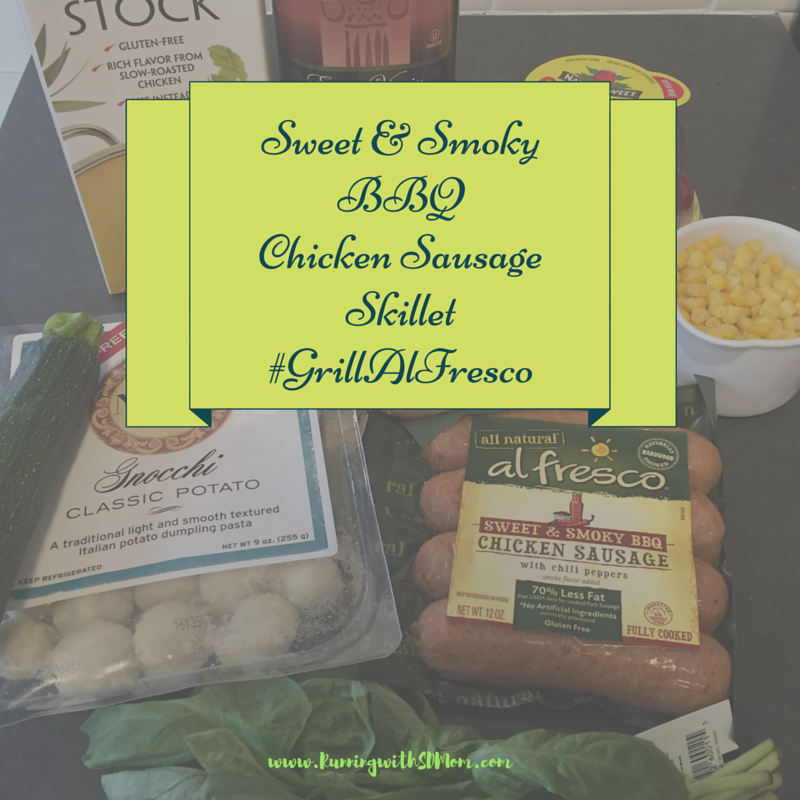 So when I was sent al fresco's chicken sausage in new sweet & smoky BBQ flavor, I knew it would be the perfect combo! In fact, this is the meal I chose to cook as the first meal in the new house. I went grocery shopping and bought all the ingredients. I love this time of the year because the zucchini and squash and tomatoes and corn are all bursting with flavor. For the original recipe, go here. Here is my experience in pictures. Laid out the sausage (fully cooked and gluten free) on the cutting board and cut into 1/2 inch rounds. Next the onion. Then the squash and zucchini. Brown the sausage and onions. Add in the zucchini and squash. Slice cherry tomatoes in half and chiffonade basil. Add it in along with some fresh summer corn. Add in some chicken broth and let it create a thin sauce. Plate up and serve with Justin Sauvignon Blanc or Goose Island IPA. A perfectly lovely and delicious fresh summery meal. And the sausage was perfect in this dish because it had just the right amount of smokiness and sweetness to round out the fresh sweet tomatoes and herby basil scent. I am loving the al fresco sweet & smoky BBQ sausage! It is made with lean, skinless chicken, has 70% less fat than pork sausage, 30% less sodium than pork sausage, gluten free and fully cooked! What more could you want?! BUT WAIT! Now thru July 31, visit http://www.alfrescoallnatural.com/promos/summer-grilling-sweeps and vote for your favorite grilling recipes using sweet and smoky BBQ. When you vote, you will be entered to win $500 AND a high quality grill ($500 value). Thank you for reading about my first cooking experience in my new house. Do you remember your first experience? What did you cook as the first meal in the current house you live in? Do you like chicken sausage? I could eat it EVERY DAY! This is a sponsored conversation written by me on behalf of al fresco. The opinions and text are all mine. I honestly cannot remember the first meal we ate when we moved here about 9 months ago! I'm sure it was a hodge podge of whatever pantry staples we brought from our old house though, haha! I thought that was potato in the picture. I'm even more interested knowing it's gnocchi. I adore gnocchi. This looks AMAZING!! What a fun combination. I love that you also suggested what to drink! So much fun! !